Volatility returned to markets in early February, sparked by strong US wage growth data. After months of calm, the S&P 500 equity index fell by 4% on 5 February and the VIX – a measure of US equity volatility that is sometimes referred to as Wall Street’s “fear gauge” – experienced its largest one-day move in its 28-year history. 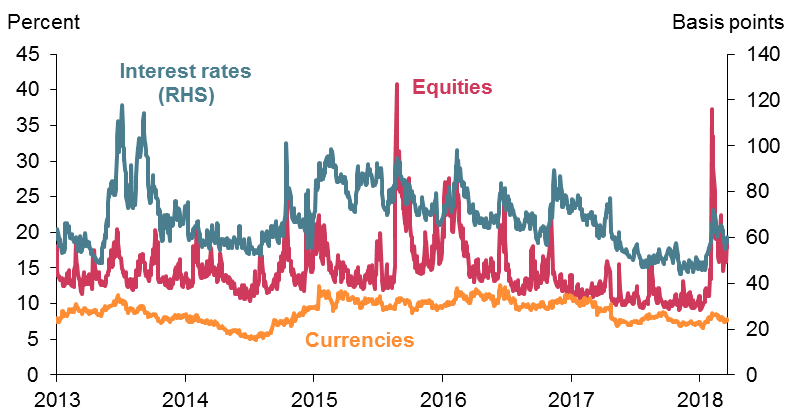 Interestingly, measures of volatility in other markets, including interest rates and currencies, moved by much less. So what caused the outsized spike in the VIX? Some of the rise was linked to rebalancing flows associated with VIX exchange-traded products (ETPs), which can amplify moves in the volatility market. 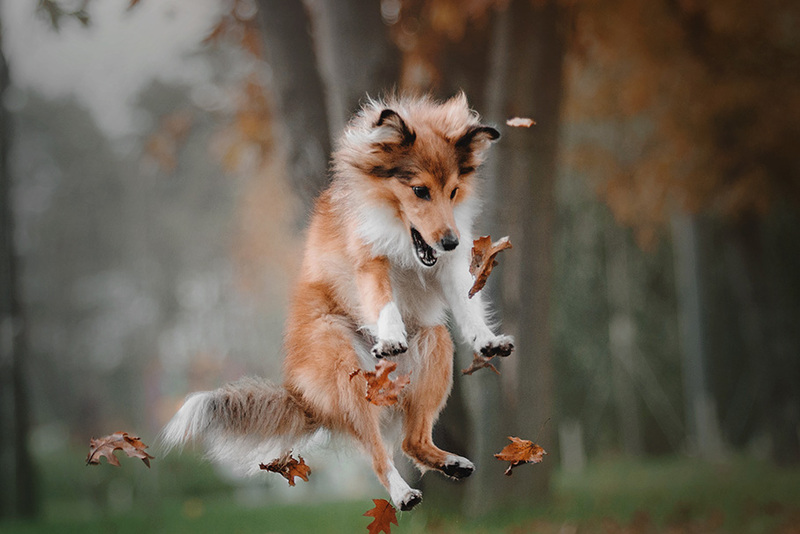 The events have also led to some questions whether developments in VIX ETPs can also affect the S&P 500 itself –whether the ‘tail’ can wag the ‘dog’. Note: The VIX and the MOVE measure the 30-day option-implied volatility of the S&P 500 and US interest rates, respectively. The CVIX measures the 3-month option-implied volatility of nine major currency pairs. Simply put, volatility measures how much an asset price moves over a given time period. The closely-watched CBOE Volatility Index (VIX) provides a measure of expected volatility of the S&P 500 over the next 30 days (plus a “risk premium”). It is impossible to trade the VIX directly, given it is just an index calculated from prices of a range of options on the S&P 500. But investors can position for a rise or fall in the VIX through the use of VIX derivatives, such as VIX futures and VIX options. 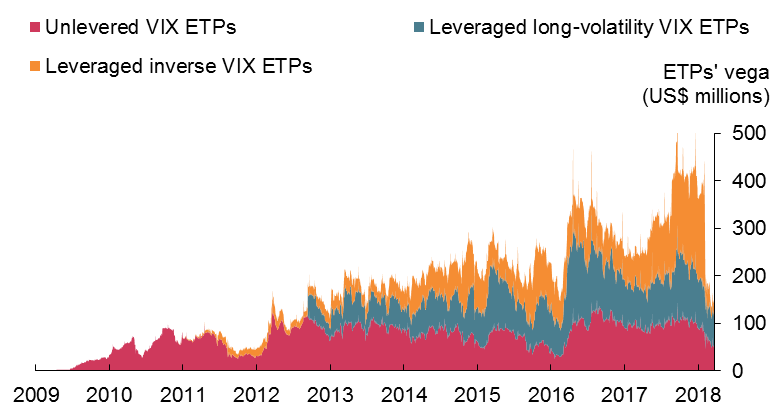 VIX ETPs, a further category of VIX-linked instruments, were introduced in 2009, opening up the VIX market to retail investors. They are securities issued by banks and providers of exchange traded funds that in most cases provide the investor with a return linked to the prices of VIX futures that on average mature in one month’s time. Investors can buy ETPs that are designed to benefit from either a rise or a fall in volatility. Since their introduction, their popularity has soared, with assets under management of different types of ETPs (both unlevered and leveraged) reaching over $5 billion at the end of January, while their exposure to volatility reached over $400 million (the combined area in Figure 2). Since early February, their exposure has fallen back substantially. Sources: Bloomberg and Bank calculations. Note: Volatility exposure (“vega”) of major short-term VIX ETPs. Red area shows unlevered ETPs that benefit from rising volatility. Grey area shows leveraged ETPs, whose returns are linked to a multiple of volatility. Orange area shows ETPs which benefit from falling volatility. Investing in VIX ETPs that benefit when volatility rises is similar to buying insurance. The buyer loses money if volatility stays low or falls, similar to paying an insurance premium, but makes a profit if volatility spikes. Conversely, investing in VIX ETPs that benefit when volatility falls is similar to selling insurance. The highly skewed returns make this akin to “picking up pennies in front of a steamroller”: on most days, the investor makes a small profit, but they risk catastrophic losses if volatility picks up. The metaphorical insurance premium against volatility is very costly. Holders of VIX ETPs that were positioning for higher volatility would have lost around 99% of their invested capital if they had held the position for the five years between 2013 and 2017. On the other hand, holders of ETPs that were positioning for lower volatility over this period would have multiplied their initial investment by around eight times (Figure 3), given volatility has been unusually low for much of this period. Note: Example cumulative returns from a buy-and-hold strategy in VIX ETPs that position for a rise in volatility (red) and a fall in volatility (grey), initiated in January 2013. Unsurprisingly, the high returns associated with investing in ETPs that position for volatility to fall made this a popular trade in recent years. But the flip side of this has been a build-up of risks. At the end of January, around 80% of the exposure of VIX ETPs was in so-called ‘leveraged’ VIX ETPs, which offer a multiplied exposure to volatility. For instance, a leveraged ETP used to position for higher volatility might offer the buyer double the profit or loss associated with a given move in volatility, relative to an unlevered ETP. All ETPs that are used to position for lower volatility are by definition leveraged, given they offer an exposure which moves in the opposite direction to volatility. The way that leveraged ETPs are set up means that their issuers have to buy or sell VIX futures on a daily basis to keep the exposure to volatility at the stated level. Importantly, these rebalancing flows are always in the same direction as the initial move in volatility. When volatility spikes, issuers of leveraged VIX ETPs have to rebalance at the end of the day by buying large amounts of VIX futures. Perhaps somewhat counterintuitively, rebalancing flows are procyclical regardless of whether the ETP benefits from rising or falling volatility – issuers of both types of ETPs have to rebalance in a way which amplifies initial moves in volatility (Figure 4). The fact that other market participants can often anticipate these rebalancing flows can create a feedback loop, where the expectation of buying flows at the end of the day pushes up on the price of VIX futures and increases the actual ETP rebalancing need. This is what is thought to have happened on 5 February. The price of one-month VIX futures spiked by 96%, its biggest ever increase, resulting in large losses by holders of ETPs positioning for lower volatility. The increase in volatility meant that issuers of leveraged ETPs had to buy VIX futures to rebalance. The Bank’s contacts estimated that this would have resulted in ETP issuers needing to buy around 120-250 thousand contracts on 5 February, or around 55-110% of average daily volumes in the first two VIX futures contracts in January. This amplified the spike in prices of VIX futures. Equity prices and VIX futures tend to co-move (in opposite directions), but in this instance, the rise in the price of VIX futures was much larger than would have been expected based on the historical relationship. Indeed, as Figure 5 shows, spikes in prices of VIX futures do appear to have become sharper for a given fall in the S&P 500 since 2012, which roughly coincides with the growth of leveraged VIX ETPs. 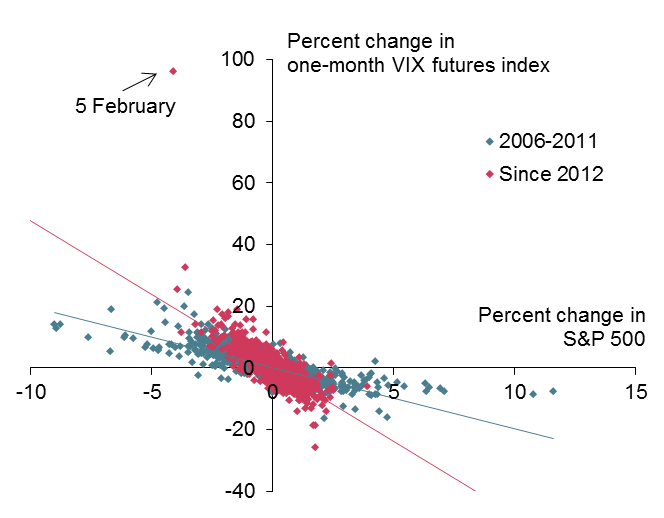 Note: The chart shows the relationship between daily changes in the S&P 500 and VIX futures over two time periods: 2006-2011 (grey) and since 2012 (red). But in addition to making spikes in volatility sharper, VIX ETPs also have the potential to make them shorter-lived. When volatility spikes, holders of VIX ETPs positioning for higher volatility need to quickly sell their ETP holdings in order to realise a profit. This is because volatility spikes tend not to persist and eventually volatility falls back down to around previous averages, which erodes the profit. At the same time, a spike in volatility tends to be seen as an opportunity to initiate trades positioning for lower volatility. Together, these flows put downward pressure on the price of VIX futures in the days following the volatility spike. Can developments in VIX ETPs spill over to the S&P 500? Developments in VIX futures are closely linked to moves in the VIX itself, which is calculated from prices of S&P 500 options (for instance, market makers in VIX futures might use S&P 500 options as a hedge). In fact, the VIX spiked by 116% on 5 February, roughly in line with VIX futures prices. Around a quarter of the increase took place at the end of the day, when issuers of ETPs would have had to buy VIX futures to rebalance. On volatile days, what happens in the VIX ETPs market can impact the level of the VIX. That said, according to the Bank’s contacts, developments in VIX ETPs tend not to spill over to the S&P 500 – or that the VIX ETP “tail” does not wag the S&P 500 “dog”. Unlike VIX futures, there is no mechanical link between hedging flows linked to VIX ETPs and equity prices. The universe of VIX ETPs is also relatively small. After the February volatility, assets under management of VIX ETPs have reached around $2 billion, which pales in comparison with the $24 trillion market capitalisation of the S&P 500. Any impact is likely to be more behavioural, if for instance a spike in VIX futures prices impacts investors’ confidence and increases the risk premium that they demand to hold equities. In any case, the procyclical dynamics associated with leveraged ETPs are likely to have subsided for now. The sharp losses experienced by holders of ETPs that positioned for falling volatility, as well as changes in leverage of some of these products, has resulted in a sharp fall in the outstanding exposure of leveraged ETPs. As can be seen by the reduction in the grey and orange areas in Figure 2, the volatility exposure of leveraged ETPs has fallen by around three quarters since early February. Nonetheless, even if what happens in the VIX ETP market is relatively self-contained, the developments in early February highlight the impact that non-fundamental – and often procyclical – flows can have on closely-watched markets. In this instance, the growing popularity of leveraged ETPs could also represent a broader trend, whereby investors might be placing too much weight on the continuation of the historically benign conditions observed in recent years. Olga Maizels works in the Bank’s Monetary Assessment and Strategy Division. 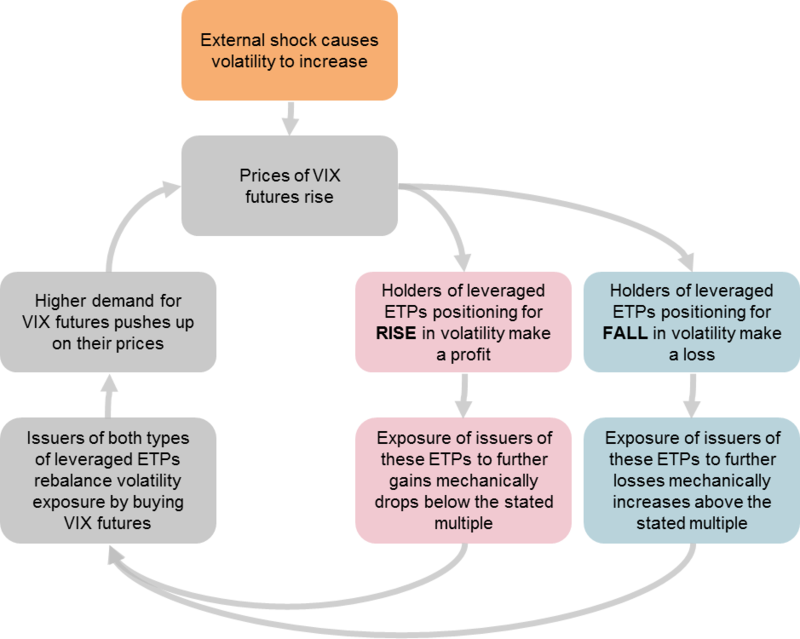 Please can you explain further the flow diagram which shows issuers have to buy VIX futures whether the ETP is a bullish or bearish bet?